EMBCA is proud to sponsor the 1st. Seraphim Canoutas Lecture entitled “We are all Greeks”: March 25, 1821- Hellenes and Philhellenes in the War of Independence for the Order of AHEPA District 6 (New York State) & Delphi Chapter #25 ( Manhattan) at the 3 West Club (3 West 51 St.), It is a community sponsored event by EMBCA and there is no admission charge for this special occasion. The event title has its roots from one of the finest lyric poets in the English language Percy Bysshe Shelley’s and from his famous poem Hellas written in 1822. In it he says – ‘We are all Greeks. 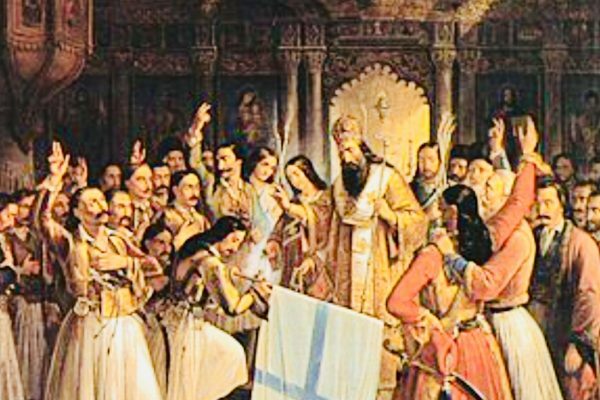 Our laws, our literature, our religion, our arts have their root in Greece’. Hellenic American Opera Singer Demetrios Jussi Tsinopoulos (Tenor) singing O Gheros Demos from “Markos Botsaris” by Pavlos Karrer. A little background , per the AHEPA, on Seraphim G. Canoutas (1874- 1944) and why AHEPA has named a new Lecture Series in his name. Seraphim was an Attorney (both University of Athens, and U.S. graduate), Diplomat, Historian, and prolific Author. He was known as the “First Historian of the Hellenes in the Western Hemisphere”. His famous Hellenic American classic “Greek -American Guide and Business Directory” was published annually from 1908 . It was historically the most useful compilation of information every assembled for the Hellenic Immigrant starting a new life in America. It contained American laws, history, geography, statistics, customs, and a complete account of American and Canadian communities and what an immigrant should expect in America, and Canada. It also contained the most complete account of every early Hellenic American community ever assembled. It listed alphabetically by state and city all Hellenic Churches and communities with descriptions , Clergy, merchants and shop keepers, physicians, newspapers, etc, with their addresses. He obtained most of his information first hand by touring every state in the union (except Arizona and New Mexico). His accomplished work has never been duplicated to the present day and his books still extensively used by scholars for research in early Hellenic American history. He was also a proud early member of The Order of AHEPA, joining soon after its founding in 1922. Seraphim G. Canoutas was an active member of the historic Order of AHEPA Delphi Chapter #25 in New York City and served as one of its early Chapter Presidents. He was cited at beginning Order of AHEPA National Conventions for his column “Eleftheron Bema” which appeared in The National Herald newspaper and which gave invaluable information to Hellenic immigrants on many subjects including among others law, business, civics, government, and medicine.